It's that time of the week again! 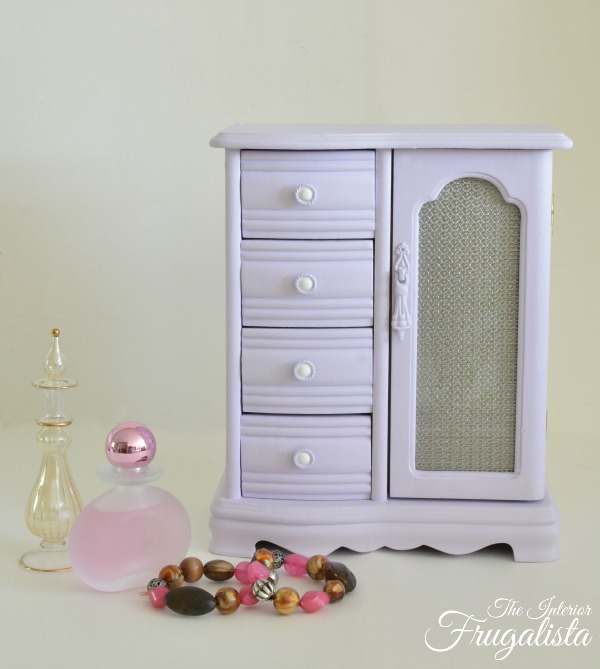 Thank you for joining me for another edition of Frugal Decor Tuesday and this week I'm sharing how I transformed a vintage jewelry box armoire in a pretty shade of Lavender. If you've been following me for awhile then you know how much I love breathing new life into old jewelry and flatware boxes found at the thrift store. 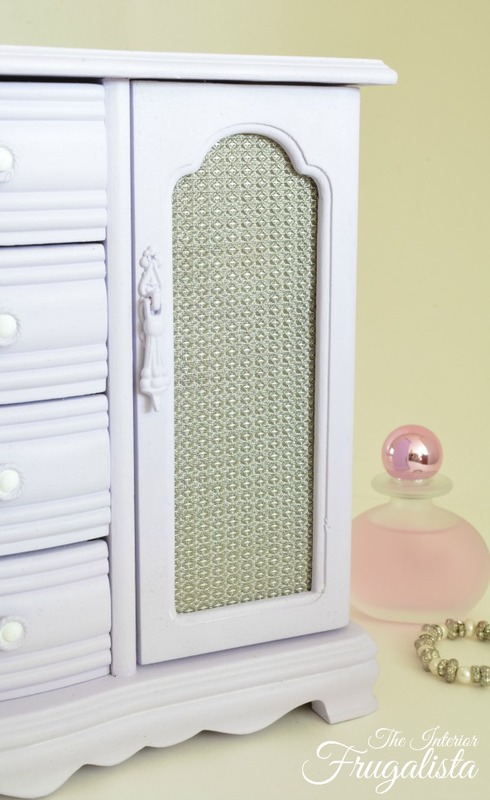 To me, they are like mini furniture makeovers and recently I gave a handful a REfresh. Isn't the color pretty? 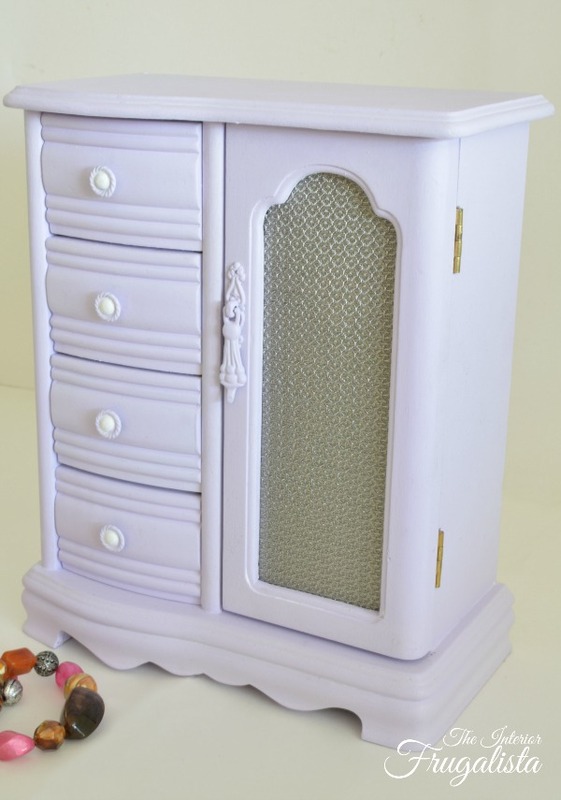 It's called Wedding Cake by Country Chic Paint. I bought the color specifically to use on the DIY décor I'm making for my daughter's wedding this summer. 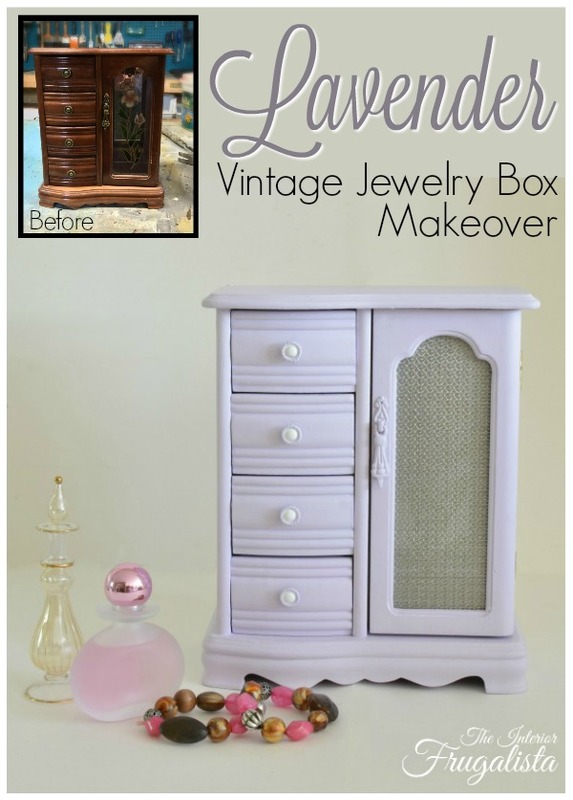 I just had to give it a try on a makeover piece first and thought a jewelry box would be the perfect guinea pig. After giving it a sponge bath with warm soapy water, I sanded it with a 220-grit sanding block to get rid of the glossy finish and give the paint some bite. Using a small angled paint brush I applied three coats of chalk paint, including the hardware. I protected the finish by applying white wax using a lint free rag to soften the color even more. 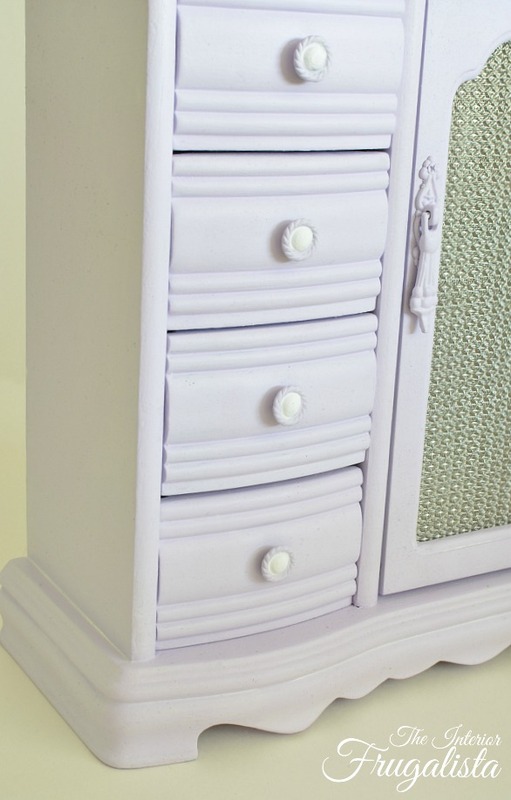 With a small artists brush, I painted the center of each knob with Simplicity White chalk paint followed by Pearl Wax to give it that pearlescent luster. 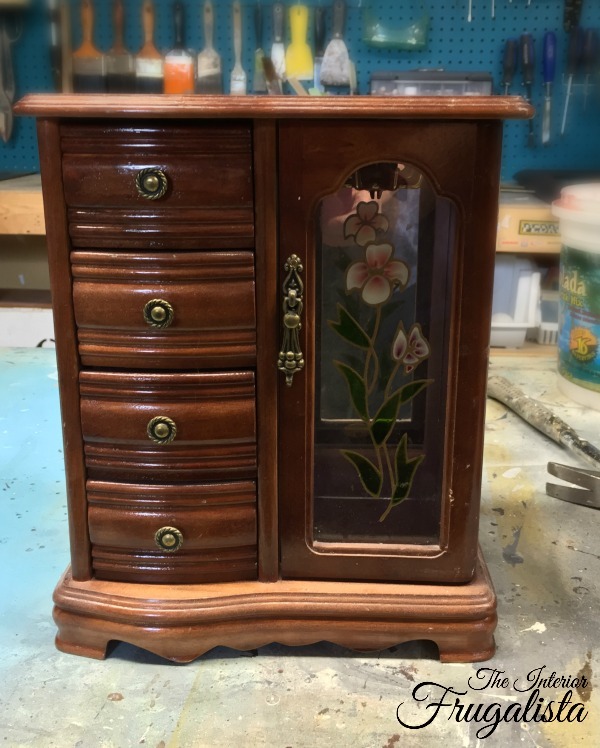 I think, besides the color, what makes this jewelry box extra special is what I used to replace the original glass on the door. It's called Structura architectural wire cloth and lucky for me, Mr. Frugalista brought home some small samples a few years ago that I had put away in my stash. I placed the glass over the cloth and marked it with a sharpie and cut it out using these much too large vintage forged metal tin snips. 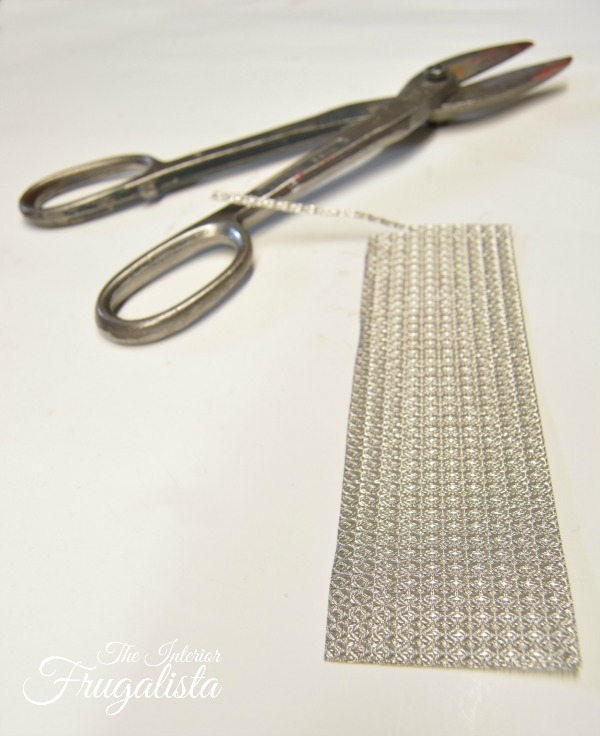 I needed something rigid to place the wire cloth against (it is a very soft material) and decided to give the new owner the option of using either the cloth or the original glass. I always try to salvage the original felt liner and then paint the exterior in a complimentary color. Tip: Use baby wipes to clean the felt - works like a charm. This and another that I'll be sharing in a few weeks sold rather quickly at the Antique Mall Outdoor Market in May. Please join me on Thursday where I'll be sharing a Round Pedestal Dining Table Set that received a lot of interest at the outdoor market and sold. 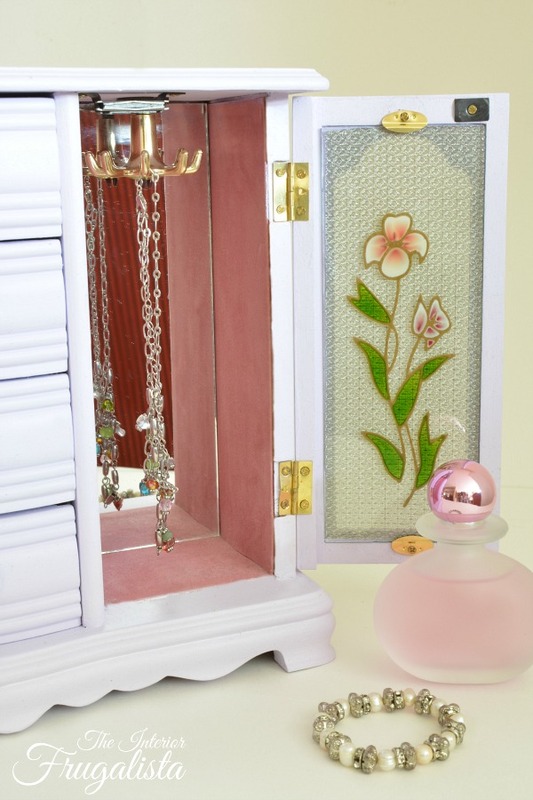 Will you think twice about walking by these vintage jewelry boxes during your next thrift store treasure hunt? Have you been following the Between The Lines series?